I was quite disappointed with the site, it had the potential to be amazing, but fell short. The not so good bits, there were lots of old caravans permanently sited which looked like the had been dumped. One had loads of rubbish left under it. It made the site feel unloved and uncared for. The rubbish area was in the middle of the site and was a mess. It felt much like a dumping ground. Stayed for one night as I was touring around Wales. There was very few people about and was invited to park sideways as it was a more level option. The showers and toilets are basic but clean and with plenty of hot water and toilet paper. The dogs had fun playing down by the river. I wouldn't hesitate to come back to this site. It was lovely and quiet. 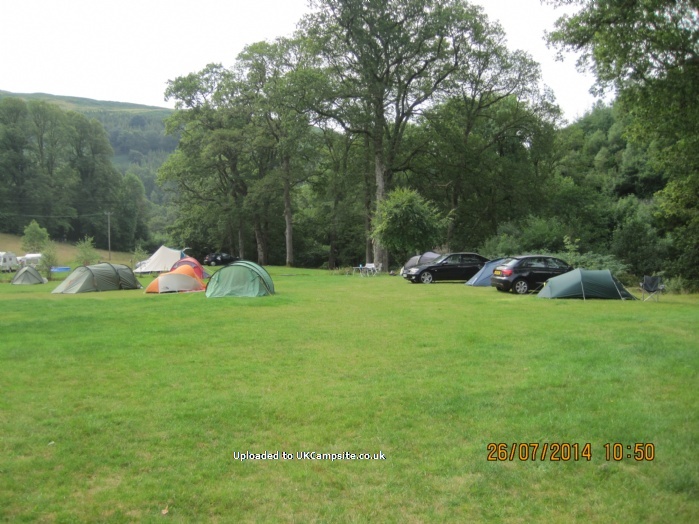 This is a fantastic beautiful campsite with a river running through it. Been going for many years with the family. The site has now upgraded the toilet block and has great hot showers and is kept spotlessly clean. Love this place. Also great local shops and pubs in machynlleth town. Once again we visited. Splendid, what a very nice place. Lovely owners who are glad to help. Its not posh, its just beautiful-now that is posh. Cycling, mountain biking, walking, exploring. Local pub. What more do you want. No children’s playground, but the whole valley is a children’s playground. I believe Disneyland has a children’s playground-but that’s in Paris. 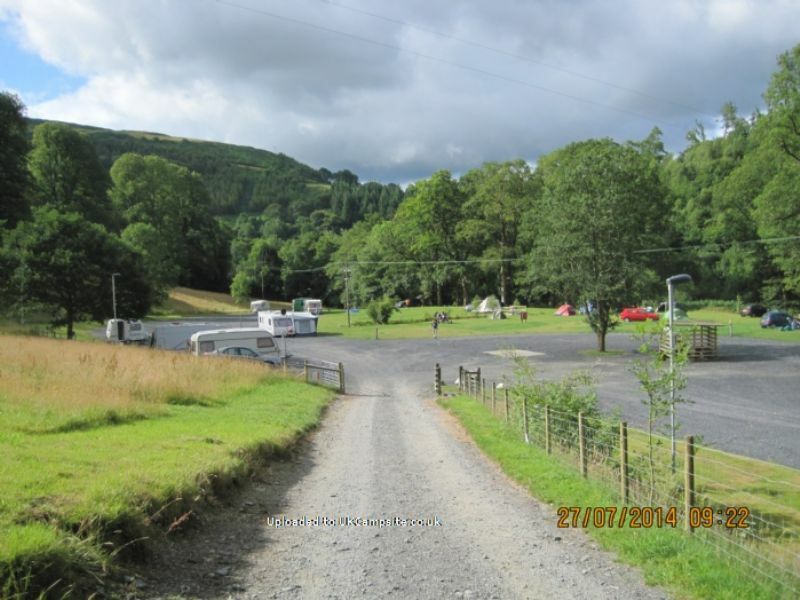 The site, which has recently been re-landscaped, is about 3-4 miles north of Machynlleth, which is a friendly and interesting town with superb fish and chips and a selection of pubs. The Corris Craft centre is close by (short drive) and has a brilliant cafeteria with home-made scones ta-boot. Would like to say a huge thank you to Raiph for allowing us to stay at the site, when we did our 175 mile trek for Cerebra! He gave a warm welcome, had put up the walk posters and even gave a rare appearance for our event photos with Sir E Bear the charity mascot! The site is in a gorgeous spot and I would heartily recommend people visit as there is loads in the local area to visit! I shall be making the journey up to visit again soon! We were happy to find the campsite open again after the pipeline went through 2 years ago. The ground has been reworked and is flatter than before with a larger area of hard standing for caravans and more waterpoints. No midges as it was early in the year and the stream was crystal clear as always. This the only campsite within easy cycling distance ( about 1. 5 miles ) from the entrance to the Climach downhill mountain bike routes. If you go up there in the early afternoon the local pub, Tafarn Dwynant in Ceinws opens at 5. 30 for a well earned pint before cycling back for dinner around the campfire. The owner is always really friendly and helpful, and happy to recommend local routes for motorcycles- on and off road. We have just come back after 3nights in this campsite. Starting with a positive note, the site is perfect for visiting the Centre for Alternative Technology, which is just a 3mins walk away. The area is fantastic: woodland, streams and lovely villages. Unfortunately, there are many cons I feel I need to list to inform future campers. 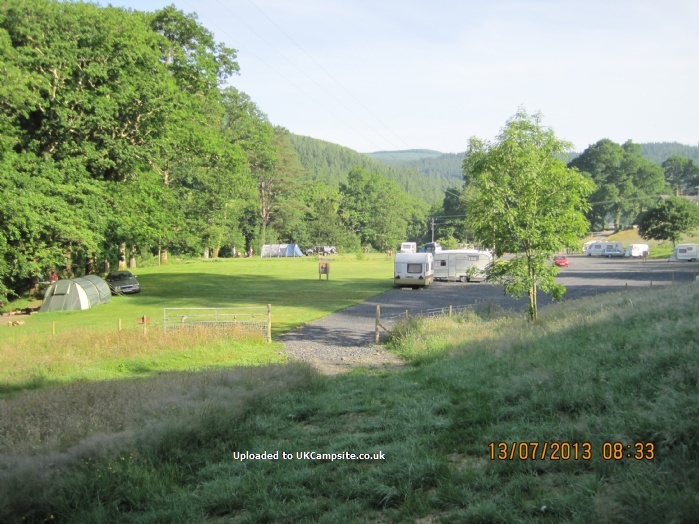 Firstly, as stated in previous reviews, the site is literally infested by midges. We are covered in bites tip to toe. This unpleasant and painful characteristic of the campsite made us leave a day before what we planned. 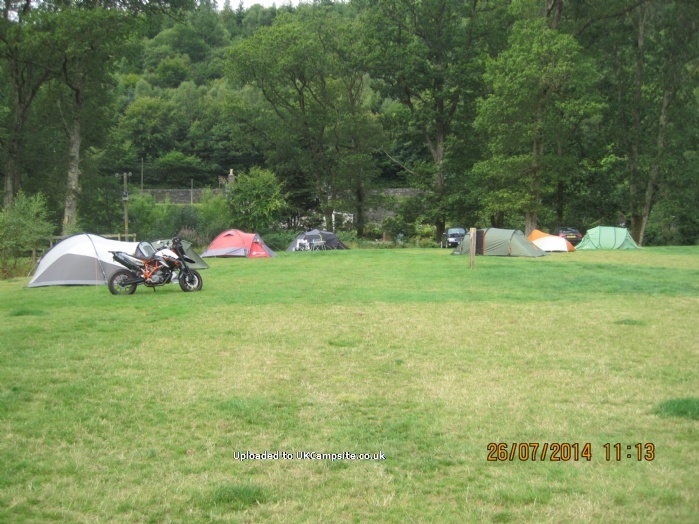 The pictures of the campsite are not showing what it actually is: a big gravelled field with a small section of grass for tents. Not the best for young children, considering that there isn't any play area. The toilet/washing up block desperately needs upgrading to the point we decided not to use these facilities at all. I am afraid to say, but I won't go back. Absolutely fantastic & beautiful picturesque place to stay with the family. We had 4 days there and it was brilliant. And the owner is very friendly. There is a river turns stream running right past the site and a waterfall in the next field. Children DO need to be supervised near the river/stream and it could also benefit from a play are maybe for the children. Machynlleth is a beautiful place to be and has a good little village a few miles down the road. We have been using this site for a few years, because of the river running through it with pools deep enough for swimming in. The river brings lots of midges, however, so come prepared with nets and/or repellant. It is permitted to light a fire close to the river, which helps a bit to keep the midges down. The camping area is very stony, so also be prepared to bend a few tent pegs. Hot water is free and plentiful, but the toilets/showers are desperately in need of proper cleaning. Sensible campers don't object to bugs and spiders, but these facilities don't seem to have been properly cleaned since we first came here four years ago. Sadly this will probably be our last visit, as at £12 a night, we can find plenty of alternative sites where the owners keep the facilities clean. the Tipi can hold around 10 people and has an open space in the centre for an open fire, unfortunately it rained for some of our visit, but inside the Tipi the rain was kept at bay, and the warmth of an inside fire was excellent, and allowed our hosts to cook entire home-made meals rather than a tin of corned beef hash which was on our menu. I would recommend the Tipi for anyone from families to groups. The Centre for Alternative Technology is less than a 2 minute walk from the site, and gives you a £1 discount on the entrance fee if you walk, which when you are so close you will have done. We did not go inside the centre, but there is a hill woodland walk up one side of the centre which we walked up, and on the way back down stopped at the café for a drink and a rest. The scenery in the area is spectacular and if you are visiting for walking and the woodland you will not be disappointed. The campsite was friendly, and the tent pitches were level and clear of debris. We camped at the top of a slope which led down to a clean and crisp local river. Although we did not need it there was mains hook ups that some of the guests were using, and there had obviously been open fires as there were some fire pits marks on the site. There were separate male and female toilets, and showers these were clean and functional, water was available from various stand pipes. Overall although the camp site was friendly, had all the facilities you may want, and was well positioned for walking or local attractions. We will be visiting again.